This level has hard difficulty and you need to use good technique to complete this level. 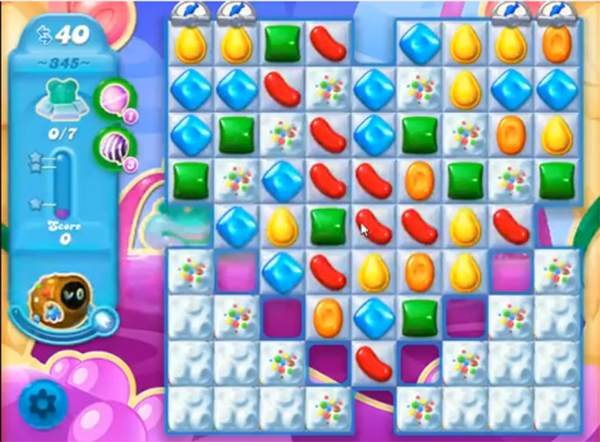 For this level you should try to play from top part of the board where you have more candies to play and try to make striped candy combo. Like combine striped candy with colorbomb or wrapped candy to break snow that are in bottom to find bears easily within 40 moves. I’m at level 395 on my tablet. on my cellular phone (same make as my tablet), I’m only at 393.
how to I get to play the same level on my tablet and phone ? Your hard levels on Candy Crush Soda and Candy Crush Saga are sooo…….boring and unbeatable. I have been on level 345 of soda for the longest time. There is no beating it!! I can’t beat level 345. I’ve been on this level forever it seems. I know its been at least 4 months. Gosh! I need help! I have just completed the level and am a novice. took some time. Now the games getting boring!! I’m stuck on 345 and it su**!!!! They just want you to pay for th boosters and more games. I cannot figure out how the top winner had such a high score!! I have been on level 345 for three weeks and cannot even get close to more than 1 bear! Stupid! Exactly. It’s all about the money. I wonder how many billions is enough for them??? This level is impossible. It isn’t even fun. I have been on it forever. So, I am going to find a different game. One that is actually fun…..Goodbye Candy Crush Soda!!! These hard boards when you get into the 300 levels are ridiculous. I swear they keep you trapped so you can’t move on. It gets boring and is no longer fun. They best step it up unless they want people to stop playing. Frustrating!!!! People will always play candy crush! I can’t tell you HOW MANY LEVELS I’ve been stuck in forever & said I was going to stop playing! I don’t use ANY of my free boosters until I get the game to a place I can understand, then I whip through it. Sometimes, I get lucky with combos & I never need a booster. It is VERY FRUSTRATING TO HE STUCK ON A LEVEL!! I just started level 345. It’ll prolly take a week for me to beat it! I refuse to spend money on this game. What are you supposed to do with the fish you earn? i have been on this game for ever. Even though there are lots of fish and color bombs they really don’t do a lot of good. There are never enough to get you even close to seven bears. I am frustrated and ready to quit the game. Was always fun up to this point. 345 is impossible, need extra help for these impossible ones, guess like others it is tine to leave candy crush soda getting too hard no fun any more. Level 345 & other harder levels are making the fame no fun. There should be a PASS button to be able to move on. Come on guys, we play games for the fun!! I’m stuck at 345. Have been for a long time. The game just isn’t fun anymore. There needs to be a way out. I like a challenge, but this is ridiculous! Help! I have been trying to beat this level for months, but its to hard, think its time to pack it in. I guess I will have to stop playing. The tips for 345 soda crush have not helped me and has stop being a fun and relaxing game. With so many people saying that level 345 is so hard and the game is no longer fun, you would think the makers of Candy Crush Soda would adjust it. I have been stuck on it too for quite awhile. I have used up my extra pieces in hopes of winning. I hope it doesn’t get to the point where I am no longer enjoying the game and stop playing. I refuse to pay anything on this game. This level is awful! No way to get through it! the video is a joke! Never get a board like that! Boring! Going to quit! I think if you get this far and haven’t spent any money they’re going to make you suffer. Sorry, not paying and rarely use boosters because they do almost no good. So far, I’ve never gone over a few days without a doable board but this isn’t looking good. Still trying for now. This may not mean anything but as I said, I never use boosters because they seem useless, but I have over 160 fish. I’ve never used one because I figured it wouldn’t be any use but then I thought why not, I have so many. The first time, I got 6 bears and the second time I won. Been playing for days so draw your own conclusions. I am a72 years old and use this game to stimulate my brain. This level is about to FRY my brain. I have played over 40 sets of 5 games (200 times) and the MOST I could ever get is 2 bears. I refuse to pay money for boosters. This is no longer fun. One of the problems is this level had too many layers of ice to break through. Maybe if this level had 1000 turns it MIGHT be winnable. I am a flute teacher and I could use my time wiser by practicing. This level is b…[email protected]#&t – I only get 38 moves for starters. I never buy boosters or anything and have had hard levels but this one takes the cake. About to call it quits cos this level is impossible. Don’t know what the makers think sometimes. To get through this level without paying any money you need to be fantastically lucky in having the power bombs and other boosters pop up all the time, just when and where you need them. Funny how that always seems to happen in the video…..hmmmm! I have been on this level for two weeks and reading some of the other comments doesn’t fill me with much hope. The best I have done to date is 4 bears (once). Most of the time I don’t get one! If there is any level harder than this then I don’t want to know about it. It is all done with the intention that you will BUY extras to get through it. They hope you will get so frustrated that you will cave in and pay up. Don’t make their day! I’m going to give up. Stucked on this level for months! Just passed this level after many tries. Secret to passing is to get and combine a color bomb with a color changer bomb for a huge explosion. This combo releases all fish in the bottom squares. Will take several moves before there is room to work on this combo. After that it only took a few more moves to win and pass this level. Watched the Video – got the Tshirt but no matter what direction I play the game I cannot win. No longer fun and I have been trying for ages. Nothing different to say but finding it really boring.. we often say “It’s impossible!” but then always get through, eventually, but I’m worried we will be stuck on this for far too long. Come on Candy Crush keep it fun, fun, fun! Obviously nobody at candy crush soda is listening. Quit now and forever be in peace. It is rigged to make us spend money and it still is unbeatable. I am in disability and going to quit and start putting my cash and boredom and common sense back into my pocket. I am stuck in Saga too, for weeks. Kissed off, not fun when it makes you feel stupid. Everybody here agrees.I will let you know if I get retrobution. The ads are enough!